Workers use elevators and escalators on a regular basis. Although these rides are usually a routine part of a person’s day, they can cause harm when the equipment malfunctions. The workers’ compensation attorneys at Pulgini & Norton represent people who have been hurt in elevator and escalator work-related accidents. A Boston elevator accident attorney can be vital in asserting your rights. Falls into elevator shaftways, which are sometimes caused by mechanical malfunctions. Elevators should have mechanisms in place to prevent their doors from closing on a person, but these can malfunction, and a worker may get his or her arm, leg, hand, or clothing caught in an elevator’s doors. 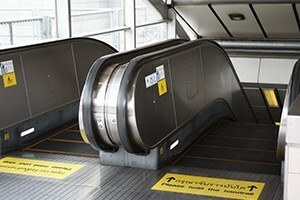 A worker may also get caught in the steps on an escalator, particularly if the mechanism is moving too quickly. Elevator and escalator accidents can cause fractures, sprains, the loss of a limb, and even a tragic death. You can potentially receive workers’ compensation benefits if you suffered an injury on an elevator or escalator at work. Workers’ compensation provides medical and financial coverage to Massachusetts employees who were hurt in the course of performing their jobs. You can seek benefits if you miss at least five days of work. Your employer will report the accident to its insurer and the Department of Industrial Accidents (DIA). The insurer will review your claim, including your medical records, medical evaluation, and proposed treatment, to determine whether you qualify for benefits. If you qualify, you will receive medical coverage for your injury and weekly wage compensation based on its severity. Other benefits may include permanent loss and disfigurement benefits, as well as vocational rehabilitation. If your relative died in an accident, you may be entitled to survivor or dependent benefits. Insurers, however, may deny a claim for a variety of reasons. An insurer can decide that your injury is not related to your job. It may also try to reduce your medical coverage and financial compensation by minimizing the severity of your injury. You can file a claim with the DIA if the insurer denies your claim or wants to reduce your benefits after it has accepted liability. The appeals process involves a meeting with a DIA representative and possibly a hearing before a DIA judge. You would have to present medical evidence to support the nature and severity of your injury. Workers’ compensation benefits essentially replace the damages you could receive if you sued your employer in a standard personal injury claim. Although you cannot sue your employer, you can seek additional damages if its egregious misconduct caused your harm. For instance, if an elevator has serious malfunctions, and your employer knew about the problem and was issued violations but ignored the issue, you may be able to recover double the amount of your workers’ compensation benefits. A third party may be responsible for an elevator or escalator malfunction. You can sue the party responsible for the malfunction, such as the manufacturer or the company that improperly repaired the elevator or escalator. A third-party claim may affect your workers’ compensation award or a settlement with your employer’s insurer. We can advise you on whether it may be viable in your case. At Pulgini & Norton, we bring more than four decades of combined practice in the law to help individuals hurt on the job. Our workplace accident lawyers are seasoned advocates who are dedicated to providing our clients with meticulous service. We can go over your situation and discuss what benefits you can seek under the law. If your claim is denied, we can build a strong case and represent you before the DIA. Based in the Boston area, our workers’ compensation attorneys represent people in communities such as Somerville, Malden, and Lowell. Call us at 781-843-2200 or contact us online for a consultation.